I thought After Eden by Helen Douglas was a really sweet story about first love and time travel. I read the book in almost a single sitting and despite the relatively simple style of writing, I really wanted to know what would happen and to learn more about the situations that the characters were in. Our main character, Eden, is a pretty average teenage girl. 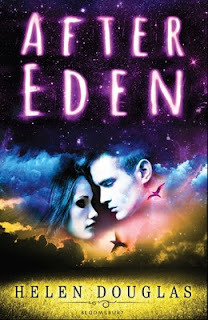 A strange and good-looking boy arrives at her school and with his arrival everything in Eden's life begins to change. The relationship that occurs here between Eden and Ryan happens gradually over time and I liked that it did. The big reveal of why Ryan is here and the reasons for his interest in Eden and also why he doesn't know major events in history or what pizza is took some time to uncover, but once it is the story's pace does pick up quite a bit. And while I was enjoying getting to know Eden and her best friend and Ryan, the addition of time travel and this time restriction put more of an urgency onto the characters and the storyline. I loved the emphasis placed on the stars and constellations in After Eden. I'm not into science-fiction that much and I'm quite glad that this book doesn't stray too far into anything overly technical or sciencey. Time travel is something that I find endlessly fascinating and I loved how the second half of the book is based around different elements of time travel and changing the Earth's destiny in the future by seemingly small occurrences in the present. The idea of the Earth's continued survival hanging in the balance because of one boy and his telescope at a party is a pretty big deal. Thanks Beth :) This was a really sweet story, I really enjoyed it!